Home builders are deflecting threats all the time, and I really don’t like to be sounding alarms on new ones without clear evidence. I believe the topic of web accessibility is a real vulnerability to the business. So much so that it I feel failing to bring it to your attention would be a disservice to the industry. With that being said, the news is not all bad. In the spirit of positive thinking, below you’ll find some straight facts along with my perspective on the threats and opportunities presented. The Internet is used by millions of individuals who cannot fully access all its features, including the visually impaired, hearing impaired, among other physical limitations. Many of those affected use special tools, such as software that reads web content aloud. 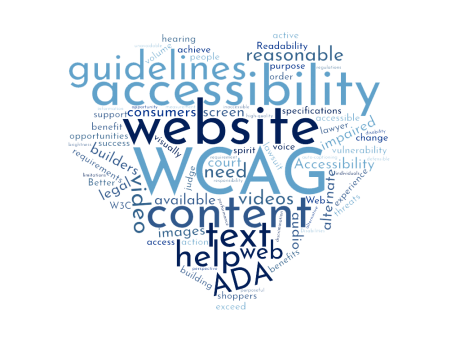 Website Content Accessibility Guidelines (WCAG) are published by the World Wide Web Consortium (W3C) and include guidelines to ensure web accessibility for all users. While some website building best practices are able to address parts of the guidelines, it requires an active human focus to meet or exceed the WCAG guidelines. In 2017, there were 814 Federal Lawsuits filed against private companies alleging discrimination due to inaccessible websites. 349 were filed in just the first two months of 2018. I have not been able to find a legal statement on this, but I can’t help but wonder if the requirements of EHO intersect with this responsibility. The Fair Housing Act specifically includes those with a “disability” among its protected classes. It could be argued that housing opportunity is not equal if all consumers cannot equally access information about the properties offered for sale. What are some example WCAG specifications? In other words, images should have alternate text (aka “alt text”) and videos should be captioned. 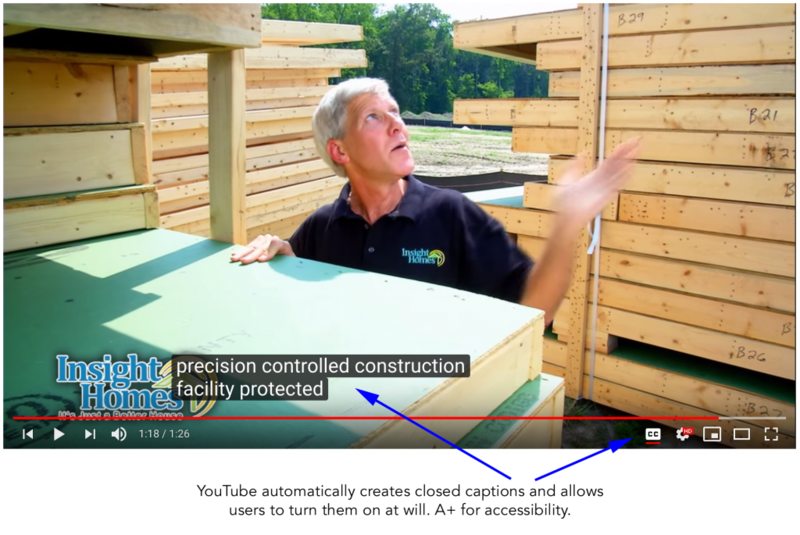 Video captions can be a little tricky, but if your videos include voice narration and are hosted by YouTube or Facebook, both have auto-captioning functions that do a pretty good job. Some sections of the WCAG are more difficult, and involve a new, unavoidable cost. WCAG 1.2.5 Level AA – Audio description is provided for all prerecorded video content in synchronized media. Consider a video style commonly found on a home builder website — A two minute long video panning across various rooms in a model home. Music playing. Occasional on-screen text labels. No spoken words. A video like this is perfectly enjoyable to someone with reasonable or better eyesight. However, with no voices to hear, there is no value to the sightless. To meet the success criterion of WCAG 1.2.5, the video would need to make available a second audio track, not unlike how you can change a movie’s audio to a dubbed language, that narrates what is being shown on the screen. That audio might include statements like, “Now being shown is a kitchen with dark wood cabinets, stainless steel appliances, and a white marble countertop. The floor is hardwood.” Clearly, this is not a common consideration in marketing departments today. It’s hard to follow the line of facts above and not see a legal vulnerability if your website is not accessible. If you missed it, we’re concerned that home builders will be sued for not providing a WCAG compliant website experience to home shoppers. The most notable proof of this is a lawsuit against Winn-Dixie, the grocery store chain, in 2017 where the judge issued an injunction requiring Winn-Dixie to update their website to meet or exceed WCAG guidelines. The judge declared the estimated $250,000 cost of the accessibility update was not an undue burden. Winn-Dixie reported in the trial that it paid $2M for its website, so the takeaway here is not that you need to spend $250k, but that an additional 12.5% expense has been ruled as reasonable by the court. What’s the upside? 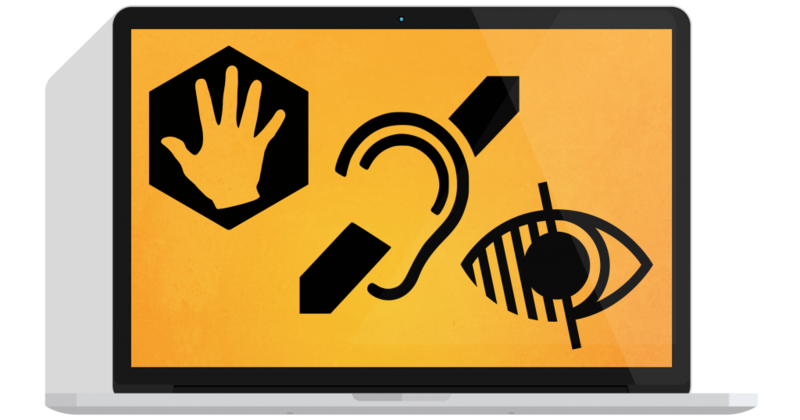 Actually, there are many really great benefits to making your website accessible. Admittedly, it was easier for me to see these opportunities once I stopped grumbling about my feelings on regulations in general. If the scenario above made you unhappy, I get it. After a few deep breaths, keep reading for how some early action might payoff. Readability. The WCAG includes guidelines for minimum contrast ratios for text and its background color to increase readability for the visually impaired. For those with 20/20 vision, this is obviously not a requirement, but still a welcome benefit — It’s nice to keep text readable while your iPhone’s screen brightness is on “low” in order to save battery life, or your trying not to have your laptop screen keep your spouse awake. No volume required. Watching videos without sound is common. People watch videos at work, in a crowd, and other places where they might not have earbuds. Adhering to the WCAG will allow anyone, even the hearing, to fully benefit from your video even with the volume off. Better Search Engine Optimization. Better content always means better SEO. The WCAG directive of accurate alternate text descriptions of images should result in higher quality content, and less keyword-stuffing. We talk often with our clients about their company, culture, and building a purposeful brand. Many home builders are active in their communities and support numerous charitable initiatives to help those in need. The spirit of the WCAG is exactly that. Talk about “burying the lede,” right? If your website communicates effectively with more people, you’ll sell to more people. It’s that simple. WCAG compliance is not a single checkbox you can complete when you launch a new website. Unless your website content stays the same forever, adding new content should include an accessibility review of that addition – the same way you test new content in multiple browsers and mobile devices. At ONeil Interactive, we’ve adjusted a number of our practices in order to ”bake in” many accessibility requirements as part of our process. However, a large part of accessibility is determined by a site’s design and content, so there is always the need for a bespoke review. We’ve begun offering accessibility reviews and implementation as a service for both new and existing sites, as this post demonstrates our belief in the need. We want our clients to be aware — to help you avoid a costly lawsuit, but perhaps even more selfish is that we want to help support your purpose. Below are some thoughts on how you can get started. Assess your current web accessibility standards performance, and how much work is needed to achieve at least AA-level compliance. Create your plan of action. Are you replacing a website soon (in the next 12 months)? If so, what compliance failures could wait for that next version? What reasonable updates could be made to your current website (even if you are replacing it soon)? In my observations, demonstrating reasonable good-faith progress makes you less of a target for an aggressive lawyer. How will you change how you think about your content and your creative process to improve accessibility? In other words, how can you ensure new images being added to your website have high-quality alternate text? To solve the issue of voiceless model home videos discussed earlier, create an account at Voices.com and pick a voice artist to narrate for the benefits of your users. Ask for help. ONeil Interactive, or a number of companies dedicated to WCAG compliance, are available to help you assess, prioritize and act. The WCAG has three levels of compliance measurement — A, AA, and AAA, each raising the bar. The legal cases I’ve referred to in this article seem to point to AA as a defensible standard. If you’re interested in learning more, below are some resources to get you started. Please note; I’m not a lawyer, nor do I play one on TV. Other than cited, the opinions above are my own based on research, and first-hand experience assessing and updating websites and web content for the purposes of WCAG compliance. As with many compliance issues, it’s likely that the absolute answers to these questions will not be available until someone wins and loses in court. In the meantime, let’s ensure it’s not you in court, and help you reach more consumers. I’m interested to hear your take. 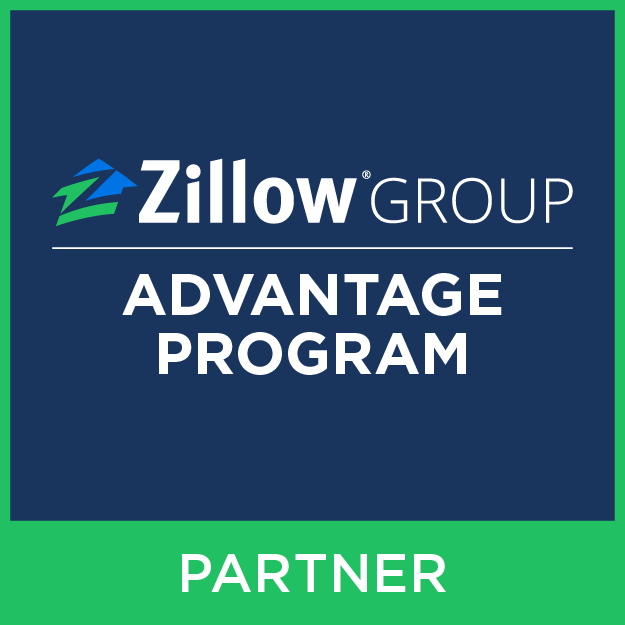 Call (410-584-2500 x111) or email me to discuss further. Web Accessibility Lawsuits: What’s the Current Landscape?